Electronic cigarettes (e-cigs) are relatively new to the Canadian market. Provincial and federal health officials have yet to declare their stand on what manufacturers claim is a healthy alternative to smoking. To date it has pretty much been decided that e-cig users will be considered smokers by the insurers. 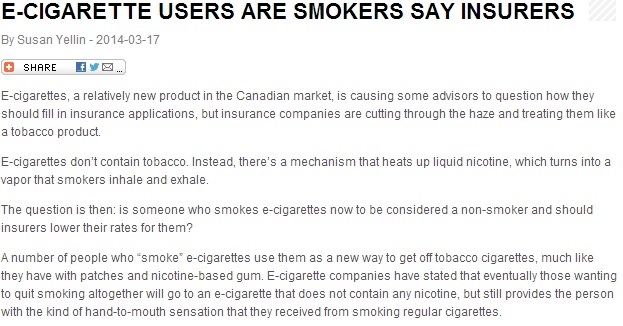 “E-cigarettes, a relatively new product in the Canadian market, is causing some advisors to question how they should fill in insurance applications, but insurance companies are cutting through the haze and treating them like a tobacco product. Manufacturers often claim that e-cigs are less dangerous than cigarettes due to the reduced nicotine content and the absence of the shocking variety of toxins found in cigarettes. E-cig nicotine concentrations can range from 0 to 48 mg/ml. With a wide array of concentrations, people looking to quit smoking can choose an e-cig liquid with a lower nicotine content and gradually wean themselves off nicotine altogether. Any cessation product that helps people intimately quit smoking tobacco is a positive step forward regarding health. However, insurance companies raise concerns regarding the use of e-cigs. First, nicotine is usually present, albeit in varying doses. Second, the act of vaping mimics the act of smoking. Third, there’s still a possibility that a would-be quitter may go back to tobacco. Most life insurance brokers in Toronto will tell you that smokers pay more for insurance. When you apply for life insurance, you are usually required to undergo a brief Paramedical exam. During the underwriting of your application they will usually test for the presence of a marker in your urine sample that will indicate if the applicant uses nicotine. Most smoking cessation products like the patch that administer nicotine to help the smoker quit will show in the urine test and result in the applicant being considered a smoker. E-Cigs are no different if nicotine is present. There is a strong argument for those using e-cigs without nicotine, not to be considered smokers but this will ultimately be determined by the insures who have the final say. Indeed, the cost of smoking has a significant bearing on insurance costs. You may want to consult a trusted life insurance broker in Toronto like Insurance Advantage to know more about the impact of e-cig use on your monthly premiums.